Within the Magill Library on the Haverford College campus, Haverford, Pennsylvania. The Quaker & Special Collections are housed in the Magill Library. The Quaker collection includes indexes and extensive open stacks. "Visitation Records 1785-1803" microfilm [only] at Haverford location B22B. Died, on fifth day evening, the 11th inst. Edward Randolph, Jr of this city, in the fifty-first year of his age. The Firend, Phila[delphia, Pennsylvania], [vol] 8 (1835) [page]88. Died, on the 12th of last month, at his residence in this city, Edward Randolph, after a short but severe illness, in the 84th year of his age. His loss, both to his family and friends, is painfuly and severely felt; yet they have the consoling assurance that his mind was fully prepared for the solemn close. For many years he filled the station of elder in the Society of Friends, and being endowed with more than ordinary capacity, he spent a long life in the performance of the various social and religious duties with dignity and integrity, adorning the religion of Jesus Christ, in whom his faith was unwavering, by the circumspection of his conversation and deportment. "Mark the perfect man, and behold the upright, for the end of that man is peace." The Friend, Phila[delphia, Pennsylvania], 10 (1837) [page] 212. [Died], on Fourth-day, the 23d instant, after a protracted and painful illness, Elizabeth Randolph, of this city, aged fifty-nine years. The Friend, Phila[delphia, Pennsylvania], [vol] 18 (1845) [page] 352. Died, - At his residence, Bridgetown, Nova Scotia, on the morning of the seventh of first mo., 1849, Joseph Fitz Randolph, aged 68 years, an esteemed member of China Monthly Meeting, Maine. He rose after a very comfortable night's sleep, walked to the fire, sat down, and while in the act of dressing his feet, expired, without a struggle or a groan. Friends' Review, [vol] 2 (1849) [page] 345. [Died] on third day evening, the 26th of eleventh month, 1839 at the residence of his son-in-law, Jos. D. Evernihim, of Blazing Star, New Jersey, Jacob Fitz Randolph, in the 86th year of his age, a much esteemed member of Rahway and Plainfield Monthly Meeting of Friends. The Friend, Phila[delphia, Pennsylvania], [vol] 13 (1840) [page] 104. [Died], on the 4th inst., Abraham Hains, in the 77th year of his age, a member of the Monthly Meeting of Friends of Philadelphia. a member of the Western District Monthly Meting, in the 79th year of his age. Friends' Review, [vol] 4 (1851): [page]265. [Died], at the residence of his mother, at Upper Greenwich, N.J., 3d mo. last, 23d, Nathan M Haines, a very promising young man. HAINS.--In Philadelphia, on the 2d of Fifth month, 1873, Phebe, widow of Samuel Hains, in the 89th year of her age; and in the same place, on the 2d of Seventh month, Henry Rudolph Hains, son of the above; both members of the Western District Monthly Meeting of Philadelphia. Moore.--On the 14th of Eighth mo., 1878, at the residence of her son-in-law William Cox, in Johnston county, N. C., Zilpha Moore, in the 87th year of her age; an esteemed member of Neuse Monthly Meeting of Friends, in Wayne county. This dear sister had been afflicted for a number of years. She bore her sufferings with patient resignation, showing her continual dependence upon her Divine Master. She was cheerful amid all her trials, adn enjoyed the company of those who came to see her, often dropping a word of encouragement and sympathy. In her last hours she was calm, with the dying words, "Farewell, I am going home." Friends' Review, [vol] 32 (1878) [page] 57. [Died], On the 1st of 4th mo. last, at the residence of her father, in Wayne Co., N. C., Zilpah, daughter of Curtis P. and Smithey Moore, in the 15th year of her age, a member of Neuse Monthly Meeting. Although the loss of this dear child was keenly felt by her parents and relatives, they mourn not as those that have no hope believing that her end was peace. Friends' Review, [vol] 12 (1859) [page] 730. [Died], on the 12th of Seventh month last, in Sadsbury township, Lancaster county, Pa., Robert Moore, in the 70th year of his age; a member of Sadsbury Monthly and Particular Meeting. He appeared to bear his afflictions, which lasted for several months, with christian patience. The Friend, Phila[delphia, Pennsylvania]., [vol] 31 (1858) [page] 416.
in the 32d year of his age, son of Benjamin P. Moore, of Harford Co., Md. Friends' Intelligencer, [vol] 13 (1857) [page] 168. Moore.—At the residence of his son, Nathaniel Moore, in Wenona, Marshall county, Ill., on the 1st of Fourth month, 1886, David Moore, Sen., in the ninety-ninth year of his age. He was born in New Jersey, spent the prime of his life in western Ohio, and buried his wife there. For the last quarter of a century his home has been with his son in Illinois, where he died, In these later years of his life I have been ery intimately acquainted with him, and ever found him a kind generous friend, ready to give good advice and a reason to everyone that asked for the hopes he had for the future. The deceased was a valued member of Clear Creek Monthly Meeting, but has been unable to attend much for years. He had been blind for the last ten or twelve years, but he gaev abundant evidence that his spiritual vision was undimmed, that his lamp was kept trimmed and burning, and that he could “read his title clear” to a heavenly mansion, a house not made with hands, eternal in the heavens. Our dear friend has a sister still older than himself in Ohio, who if she lives till the Sixth month, will be a hundred years old. He has left three sons all advanced in years, and has lived to see the fourth generation of descendants. One son, a few days before the father’s death, celebrated the fiftieth year of his married life. Our friend had no sickness; the delicate machinery was just wron out, and “like a shock of corn fully ripe he was gathered to the Father.” The end of the good man is like the dazzling glory of the setting sun that casts its rays back to the place of its starting : may we emulate him in his sterling qualities and may our later days be like his. At a solemn meeting on the occasion, two communications were listened to, commemorative of his good and virtuous life, and before the Friends separated a solemn prayer was offered. Friends Intelligencer, [vol] 43 (1886) [page] 265. Died, First month 12th, after a short but severe illness, Ann Moore, widow of the late Andrew Moore, in the 71st year of her age, a member and overseer of Sadsbury Monthy and particular Meeting. The humble and affectionate deportment of this beloved Friend has left a sweet savour behind her. The Friend, Phila[delphia, Pennsylvania], [vol] 20 (1847) [page] 200. [Died], On the 4th inst., West Gwillimbury, county of Simcoe, Canada West, of a lingering illness, Anna Moore, widow of Joseph Moore, and daughter of Asa and Mary Rogers, in teh 49th year of her age, a member of Yonge Street Monthly Meeting. Although the path of this dear sister was truly a tribulated one, she was enabled to testify to the sufficiency of Divine Grace, and has left with her friends the consoling evidence that her end was peace. Friends' Review, [vol] 14 (1860) [page] 186. Married,--At Smyrna meeting house, near Richmond, Indiana, on the 29th of 6th mo., last, Linus Mote, of West Branch, Miami County, Ohio, to Hannah L. Grave, of the former place. --, At the same place on the 31st of 8th mo. last, Henry Jay to Priscilla Reed. --, At the same place on the 2 of 11th mo., last, Elijah Hill to Rebecca Mills. --, At the same place, on the 30th of same month, Joseph Hill to Amy Kendall. --, At Whitewater meeting house, Richmond, Indiana, on the 3d ult., Dennis Kendall to Rebecca Jane Hill. 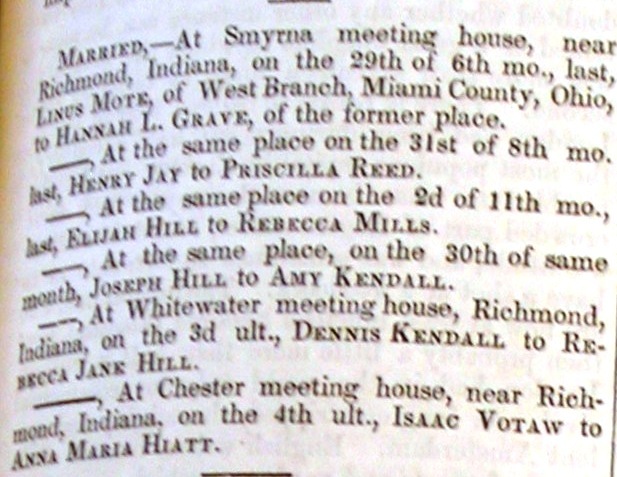 --, At Chester meeting house, near Richmond, Indiana, on the 4th ult., Isaac Votaw to Anna Maria Hiatt. Friends Review vol 2 (1849) p345. James W. Tyson, of Baltimore, to Elizabeth W., daughter of Mordecai L. Dawson, of this city. Friends' Review vol 31 (1858) p265. Married on the 13th of 3d mo. 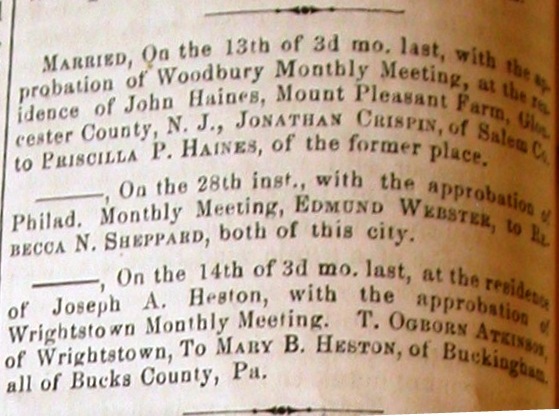 last, with the approbation of Woodbury Monthly Meeting, at the residence of John Haines, Mount Pleasant Farm, Gloscester County, N. J., Jonathan Crispin, of Salem Co. to Priscilla P. Haines, of the former place. --, On the 28th inst., with the approbation of Philad. Monthly Meeting, Edmund Webster, to Rebecca N. Sheppard, both of this city. --, On the 14th of 3d mo. last, at the residence of Joseph A. Heston, with the approbation of Wrightstown Monthly Meeting. T. Ogborn Atkinson, of Wrightstown, To Mary B. Heston, of Buckingham, all of Bucks County, Pa.